We’re smack dab in the middle of it. 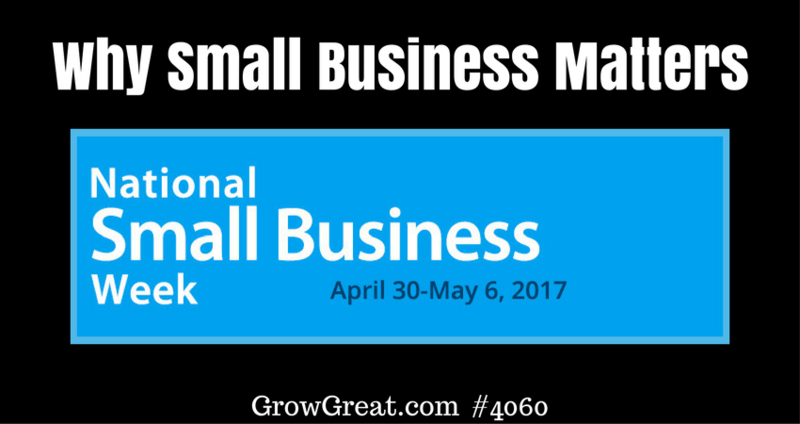 National Small Business Week. Sure, it’s a PR move to draw attention to an important community that fuels a big chuck of the economy. This event started in 1963 when the business landscape looked very different. But today there are over 28 million businesses around our country. Each one driven by a passionate owner trying to make a difference in their community and among the people they serve. It depends on who you ask. According to Wikipedia it’s a manufacturing business with fewer than 500 employees or a non-manufacturing with revenues below $7.5 million. But that’s not right. Not in the spirit of what it means to own and operate a small business. I know owners running businesses that do in excess of $100 million. Ask them and they’ll happily, proudly tell you they own a small business. It’s less about size and more about heart, involvement of the owner and the flatness of the organization. It’s about a man or woman who so firmly believes in their work that they’ve shoved all their chips into the middle of the table betting on themselves and their idea. And that’s just one reason why it matters. Small business is the heartbeat of a passionate owner willing to fight the battle to launch their idea and make it come true. It’s their individual determination to turn a dream into reality. Small business matters because it’s not just about the money. It’s more about the freedom to do it the way you think it ought to be done. Among those 28 million small businesses in America, many were started by one-time employees who figured they could do it better. Many of them have. More will follow. It’s about the freedom to wake up each day putting in the work for yourself instead of for somebody else. But it’s not just a selfish or self-centered activity. It’s wanting to do what you so firmly believe in that you take control of your own destiny. In my office is a boat oar that my sister gave me after putting one of my favorite Jack Welch quotes on it, “Control your own destiny or someone else will.” Small business owners embrace that philosophy with their actions. They know the risk, reward and value of betting on themselves. It’s not blind faith. It’s a determination that they’re not going to let the opinions of others matter more than their opinions of themselves. They’re not super heroes. Fact is, they’re not heroes at all. They’re mostly ordinary people doing ordinary, but hard things. Things others aren’t willing to do. Willing to take risks not just everybody is willing to take. Willing to gamble mostly on themselves instead of somebody else. Willing to invest in their own ideas and dreams in stead of the ideas and dreams of others. Small business ownership isn’t for everybody. It’s hip today to be an entrepreneur, but most small business owners will tell you it’s not about being hip. Or cool. Or popular. It’s about making a difference. Small business matters because it’s has a powerful impact on the lives of the owners, employees, suppliers, customers and community where it exists. It’s not the same impact as Facebook or Instagram. It doesn’t touch hundreds of millions of people around the globe. It’s more personal. More subtle. Deeper. It’s the owner and his family of four. It’s the five employees and each of their family of four. It’s the few hundred happy customers who provide their monthly patronage and whose own families are benefits because the owner had the courage to launch and open the doors. It’s the local economy and the tax deposit made monthly by the owner, pumping dollars back into the state and local economy. So here’s my little tribute to all the small business owners out there. Keep opening your doors. Fight the fight to keep your dreams alive and your employees and customers happy.